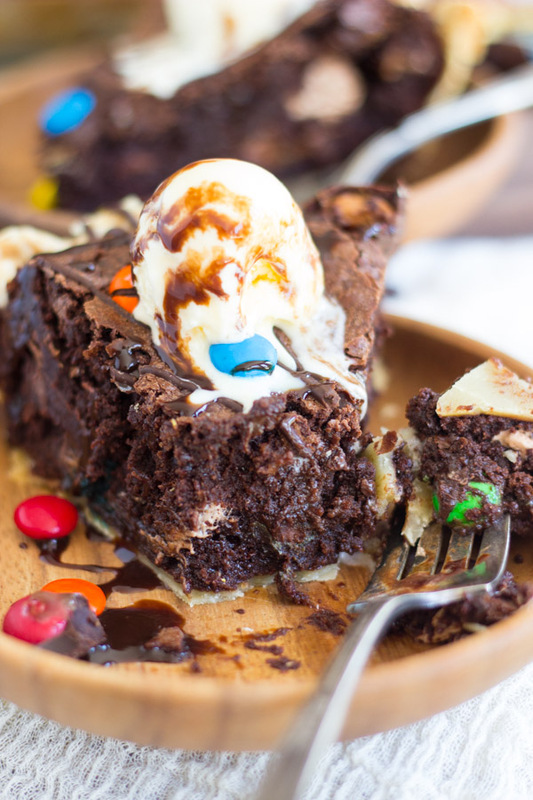 Leftover Halloween candy finds a new purpose in this ultra-decadent and fudgy Candy Bar Brownie Pie! 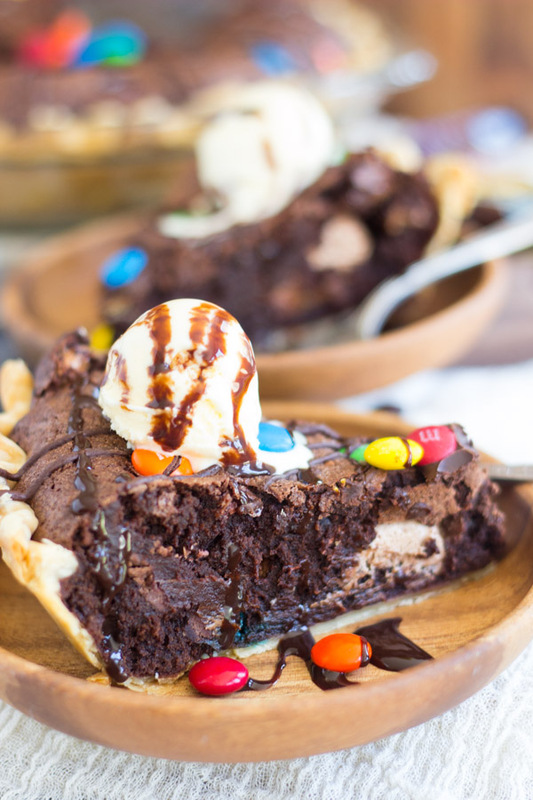 My favorite super fudgy and obscenely chocolate-y brownies are loaded with candy bars, and baked into a pie crust for this awesome and memorable Candy Bar Brownie Pie! 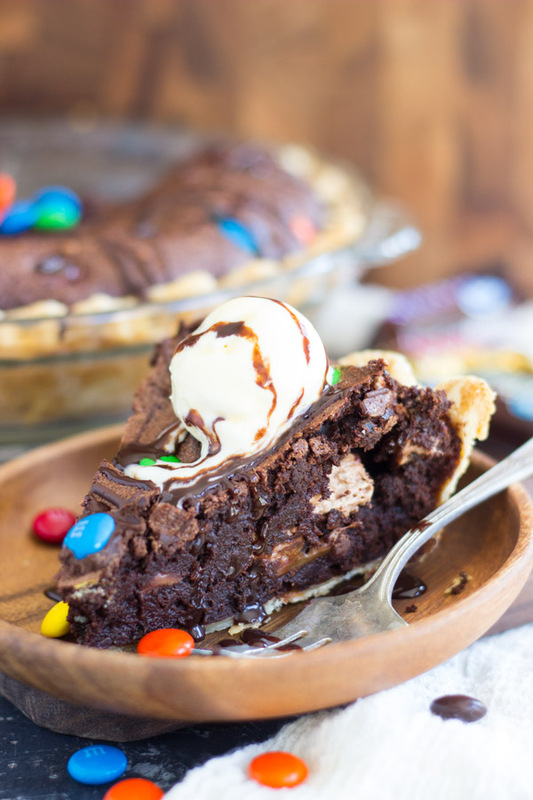 I want this Candy Bar Brownie Pie on your radar before Halloween so that when you are swimming in pillowcases full of candy bars, you have an idea for how you can use them all up. Maybe using up leftover Halloween candy isn’t a problem in your household – it wouldn’t be in mine – but in case you want to get creative with your candy stash just for fun, I have a few recipes lined up for you, and it starts with this Candy Bar Brownie Pie. 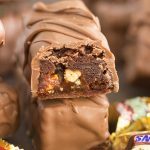 For me, I actually go out and buy Sam’s Club-sized bags of candy bars in August to put together Halloween recipes for you, and I’m lucky if enough of it lasts to get the recipe made. 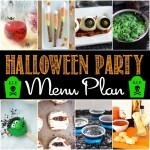 I often have to go back out to buy more candy for making Halloween recipes because sweets never last in my house. #guilty. 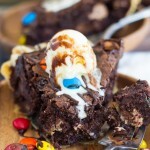 Last year, I shared these Leftover Halloween Candy Bar Brownies. Those brownies are for a serious chocolate and candy bar lover. I also shared Leftover Halloween Candy Chocolate Bark, a good recipe for when you want to throw together something in just a few minutes. Not to mention the dozens of recipes utilizing Reese’s cups on this site. So you have options. 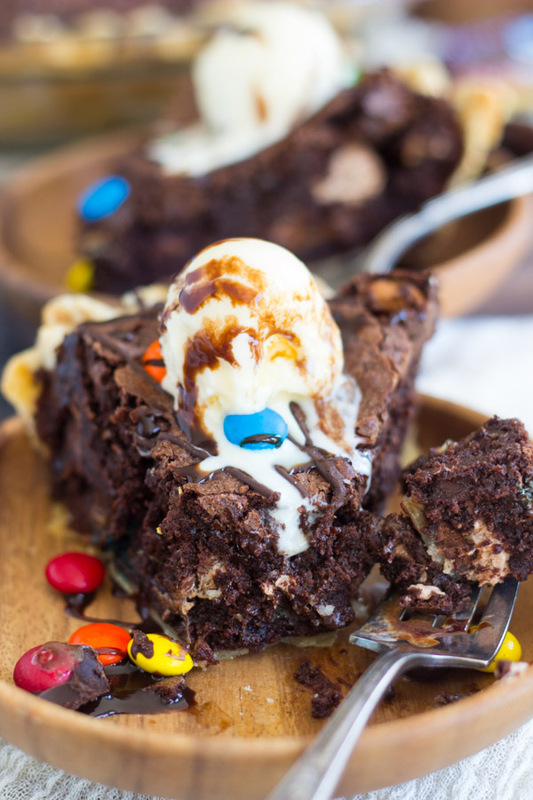 The first recipe I made for Halloween is this Candy Bar Brownie Pie. I had this pie whipped up in basically 10 minutes. It was ready so fast, and I had two other items in line to go in the oven before it. I need extra ovens! One oven is not enough for a baking blogger. It comes together so quickly. This is partly due to using a prepared pie crust, of course, and just unrolling it into the pie plate. But it’s also just ultra-easy and simple to throw together homemade brownies. I am a proponent of boxed brownie mix, I really like them, but I’ve also discovered the BEST homemade brownies that are ridiculously quick and easy to whip up. You can prep them in one single bowl, and you don’t need a mixer. They’re just a few basic ingredients that you’ve got in your pantry already. I used the basic brownie recipe from these Ultimate Fudgy S’mores Brownies. Easiest brownies in the universe, and they are insanely fudgy, as the name would imply. It’s not even right how fudgy, chocolatey, and indulgent they are. Then just load up the batter with leftover candy bars. I used Milky Ways, Snickers, 3 Musketeers, Twix, and some M&Ms. This part is flexible though, and you can use whatever candy you like, but it should probably be chocolatey. The candy will melt and seep and you’ll encounter swirls of caramel, chocolate nougat, peanuts, and all sorts of candy bar innards. I can’t think of a better word than innards? But it is almost Halloween, so I guess that’s a bit fitting. 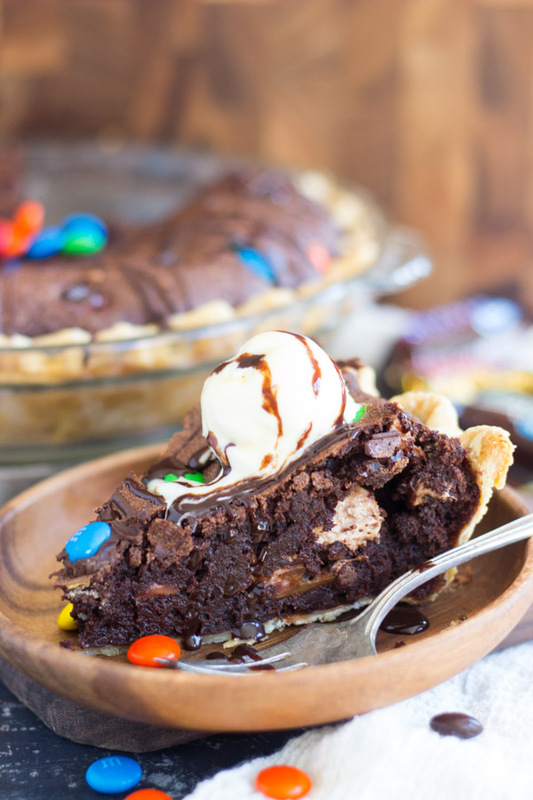 This Candy Bar Brownie Pie is beyond simple, and the reward is soooo high! 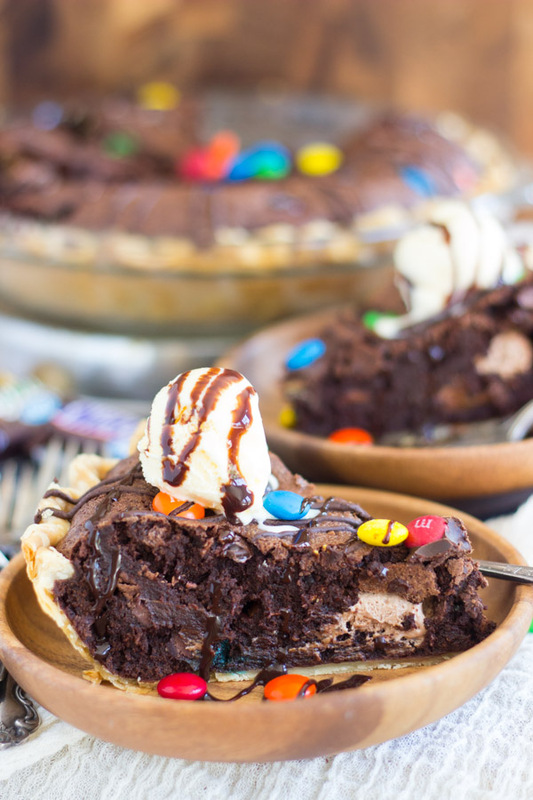 Leftover Halloween candy finds a new purpose in this ultra-decadent and fudgy candy bar brownie pie! 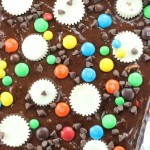 My favorite super fudgy and obscenely chocolate-y brownies are loaded with candy bars, and baked into a pie crust! Adjust pie crust into a deep dish pie plate. Pour the brownie batter into the pie crust - it will be pretty full. 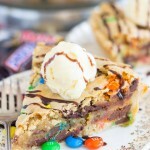 If you love the idea of this Candy Bar Brownie Pie, you may also want to check out this Candy Bar Cookie Pie! It’s fantastic! See, I’m all about the leftover Halloween candy at 50% off! Lol. I will have to get a bunch just to make this! Hahaha!!! That’s so true. Why didn’t I wait to get it on sale??? What is this “leftover Halloween candy” you speak of? Will the pie be OK with fresh candy? Lol! 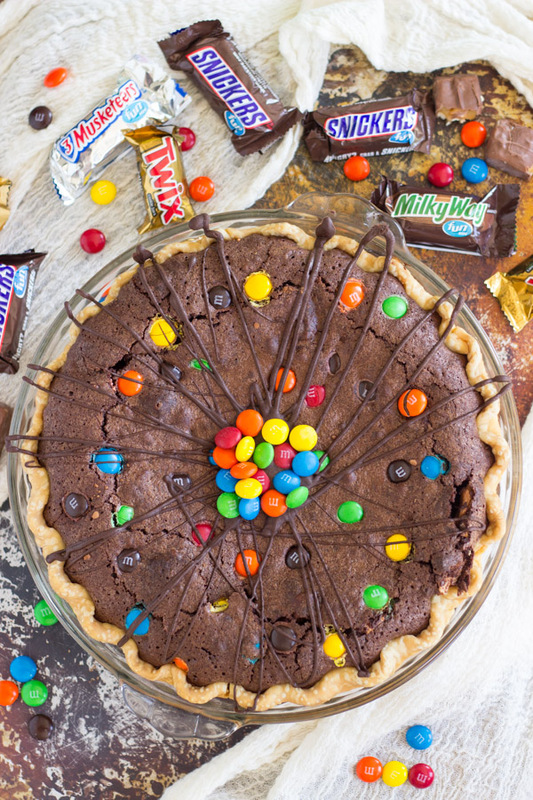 In case you’ve got piles of candy left after Halloween, this pie will help you use it up! Maybe you have kids that will bring home more candy than you know what to do with? Or you don’t end up handing all your candy out? Now you can make a pie! Yum! I love brownies and any and every variation of them. Definitely pinning for later, thanks for sharing! oh my lord -that looks so rich and incredible! Thanks for sharing at the What’s for Dinner link up! Great idea for left over Halloween candy. Looks delicious! This looks like it would definitely get rid of a sweet tooth in no time. It sounds really good. 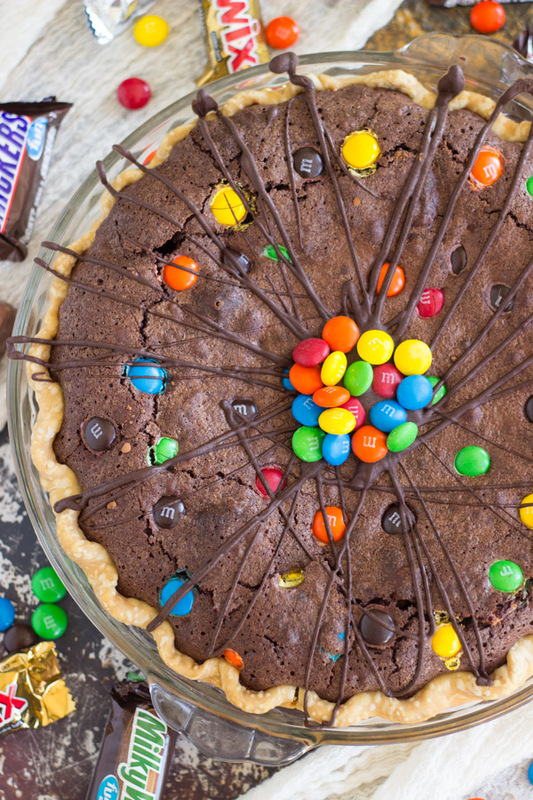 This candy bar brownie pie looks fabulous! I’d love to try a slice. 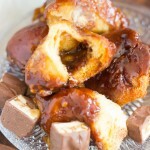 My kids would go bananas over this recipe. Thank you for linking up your post at the #HomeMattersParty. We hope to have you join us again, the door is open Friday at midnight EST.